May Walker, a graduate of the Law Enforcement Management Institute of Texas housed at Sam Houston State University, has been elected the first female and first African American constable of Harris County, Precinct 7. She won the election in November with over 82 percent of the vote and was sworn in on Jan. 2. Constables are licensed by the Texas Commission on Law Enforcement Officers Standards and Education and are commissioned by the governor as law enforcement agents. Harris County is the third largest county in the nation, and Precinct 7 has a population of more than 400,000 residents. Among the areas served as Third Ward, the University of Houston, Texas Southern University, South Park, South Union, Sunnyside, the Astrodome, Hiram Clarke, Meyerland, parts of South Braeswood, Riceville, West Airport and the Lakes of Fondren. Walker, the first female Houston Police Department patrol officer, served as a member of the Houston Police Department for 24 years. She is credited as being the catalyst for changes on behalf of minorities and women in both the Houston police and fire departments regarding hiring practices and promotions. 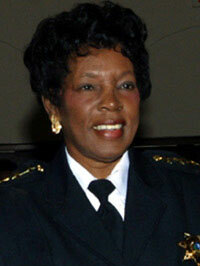 She is a former president of the African American Police Officers Association, founder of the Women in Policing Conference, and is the author of "The History of the Black Police Officer in the Houston Police Department 1888-1988," which is catalogued for use in Houston libraries, Houston Independent School District high school libraries and The Library of Congress. She also worked as an executive assistant to former Houston Mayor Lee P. Brown. Walker is a graduate of Texas Southern University. She has served as a board member of St. Mary's Parish Council and the Houston Area Women's Center, and she is a co-founder of the Adopt A Black Child program. She is also a lifetime member of Alpha Kappa Alpha Sorority, Inc. and the Phillip Randolph Institute.